The Mistress of Rome by Kate Quinn looks pretty fascinating, and is coming in May from Berkley. Thea is a slave girl from Judaea, passionate, musical, and guarded. Purchased as a toy for the spiteful heiress Lepida Pollia, Thea will become her mistress's rival for the love of Arius the Barbarian, Rome's newest and most savage gladiator. His love brings Thea the first happiness of her life-that is quickly ended when a jealous Lepida tears them apart. As Lepida goes on to wreak havoc in the life of a new husband and his family, Thea remakes herself as a polished singer for Rome's aristocrats. Unwittingly, she attracts another admirer in the charismatic Emperor of Rome. But Domitian's games have a darker side, and Thea finds herself fighting for both soul and sanity. Many have tried to destroy the Emperor: a vengeful gladiator, an upright senator, a tormented soldier, a Vestal Virgin. But in the end, the life of the brilliant and paranoid Domitian lies in the hands of one woman: the Emperor's mistress. What historical fiction are you looking forward to? Have you tried the 7 Wonders of the Ancient World series by T.L. Higley? I read the first one and have been getting them as they come out for my stepmother. All very interesting suggestions. Thankyou. I love historical fiction. I'm so with you on these two! The Rome book in particular has my interest. I wanted to make 2010 the year of the historical. I've read only one so far. Grrr. I can't think of any of off the top of my head. I don't read nearly enough historical fiction and I really don't know why since I usually enjoy it. I'm majorly looking forward to the Catherine de Medici book, especially since I loved C.W. Gortner's last book. I'll have to check out the Rome book. Wow, what a great blog! i would like to add it to Historical Blogs: Fiction & Fact.. ould you please take a look and see where it would best fit in the categories? Thanks! Both of these just went on my wish list! I can't wait for "The Queen's Pawn" by Christy English. Also can't wait for Michelle Moran's new book since I always enjoy hers! The same two as you, as well as a bunch of others. There are so many HF novels coming out these days. 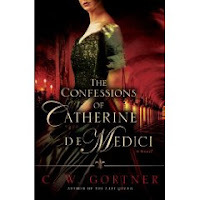 Both of these novels look amazing...I am especially excited about THE CONFESSIONS OF CATHERINE DE MEDICI... CW Gortner will be doing a guest post on my site in May. I am over the moon!